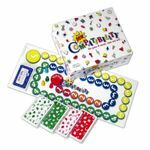 Small, white box edition of Compatibility which accommodated only up to 4 players. Unlike all other editions, this one did not feature the high-quality photographs that the game is known for. Instead, line drawings and clip art were used. The game was apparently not marketed for very long and was not well-received.